LONGING FOR THE SINGING and A NEW BEGINNING! 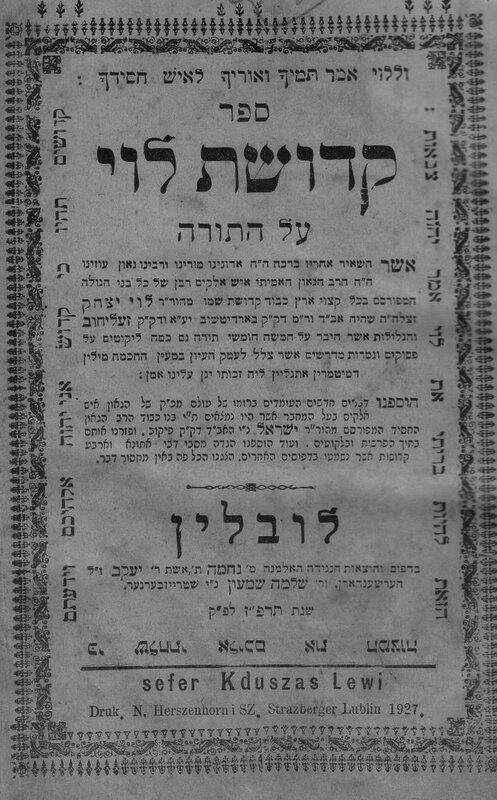 Cover page of Kedushas Levi by Rebbe Levi Yitzchak of Berditchev, 1927 Lublin [Poland] edition. Click to enlarge. The Baal Shem Tov was once sitting with his Holy Chevraya [closest disciples] discussing lofty matters of Divine Service. Suddenly a huge smile broke out on the Baal Shem's face, and he asked someone to bring a L'Chaim [alcoholic beverage] and some dainties [probably cake or biscuits]. "What's going on?" the disciples wondered. The master replied, "A great and holy neshama [soul] has just entered the world. This soul will be a great advocate and defender of every Jewish person. So we must celebrate!" That great soul was none other than that of Rebbe Levi Yitzchak of Berditchev. The great Tzaddikim not only knew when great neshamos were to enter the world; they knew when their own would depart. Right after Yom Kippur of 5570 , Rebbe Levi Yitzchak felt very weak and thought that he would soon breathe his last. Every year on the first night of Sukkos, he could not sleep - in fervent anticipation of the upcoming Mitzva of the Four Species [Arba Minim] that he could perform at daybreak. How could it be that this year, although it is so close to Sukkos, he won't be able to perform this beloved Mitzva? Aware of this, he implored the Ribono Shel Olam [Master of the World] to let him have one last Sukkos here on earth. Probably because his own life was dedicated to defending the Jewish People from all sorts of accusations and tribulations, his request was granted. 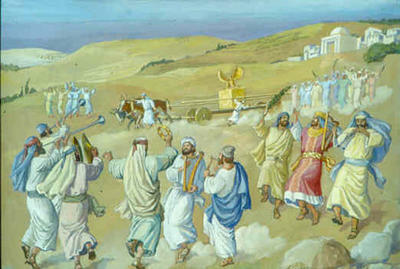 He departed from this world on the night of the 25th of Tishrei, two days after the Sukkos-Simchas Torah holidays. After his wedding, Rebbe Levi Yitzchak was supported by his father-in-law. Still quite young, he had yet to be known as a tzaddik and a holy man. Nevertheless, on the first Simchas Torah after his wedding, he was honored in his father-in-law's Shul with the recitation of the pasukim of "Ata Horeisa," the verses said right before taking out the Sifrei Torah and dancing with them. He went up to the Amud HaTefilla, the place where the one leading the prayers stands in front of the congregation. There he picked up a tallis [prayer shawl], and was about to put it on and begin the prayers, when he suddenly put it down. He waited a few moments, picked up the tallis once more, and again put it down immediately. This happened a few more times, and the congregation was getting edgy, waiting for him to begin leading the prayers. Suddenly he cried out, "If you're such a lamdan [learned person] and a Chassid, then you say 'Ata Horeisa.' " With that, he left the Amud and returned to his regular place. This strange behavior of Rebbe Levi Yitzchak's surprised the entire congregation, and was a source of embarrassment to his father-in-law. Nevertheless, they refrained from asking for an explanation until after all the Hakafos were finished. At that point, his father-in-law could no longer refrain from asking for an explanation. "When I went up to the Amud," explained the young man, "I was about to put on the tallis and begin saying 'Ata Horeisa,' when the yetzer hara - the evil inclination - came to join me in the recitation of the verses. So I asked him, "And who do you think you are that you should be worthy of this?" So he responded, "And who are you?" "Why, I'm a lamdan," I responded. "Me, too," was his retort. "And where did you learn Shas [Talmud] and Poskim [Jewish Law]? I learned by so and so. But you?" "Was I not with you all that time? This means that I too learned by these teachers." So then I said to him, "But I am also a Chassid, I learned from tzaddikim and received a derech [path] in Chassidus from them. From whom did you learn?" So he replied, "I was with you then as well - I received the same path in Chassidus as you did." When I saw that he would not leave me alone, and he insisted in saying 'Ata Horeisa' together with me - that's when I left the Amud, telling him, "If you're such a lamdan [learned person] and a Chassid, then you can say 'Ata Horeisa' by yourself!" Okay, so what does all of this have to do with Negina and Song? We are at a New Beginning, starting this Shabbos the Torah all over again from Breishis - the Beginning. The word Breishis is given numerous explanations in the Holy Zohar, the Book of Splendor and Jewish mysticism. One of them follows. "Hashem created a longing for Song in the Creation of Heaven and Earth, so that His creatures should praise and glorify Him as the Creator of all. The Heaven sings before him, as it says [Tehillim 19:2]: 'The Heavens tell of the Glory of G-d.' And the Earths sings, as it says [ibid., 96:2], 'The whole Earth sings to Him.' Furthermore, the entire world longs and rejoices in praising its Creator, upon seeing His wonders in Heaven and Earth. That is the explanation of 'Breishis' - look at the letters and see: Shir Ta'eiv, that is, a longing to Sing - for His wonders in Heaven and on Earth." [Zohar Chadash, 10b]. In the Baruch She'amar prayer recited every morning, we say, "and with the Songs of Your servant [King] David we praise You, O L-rd our G-d, with praise and Songs." Rebbe Levi Yitzchak explains that Niggunim are Avoda, Divine Service. Indeed, part of the service to G-d performed by the Levites in the Holy Temple was to Sing. Music consists of scales with octaves, with one level above the other. This, says the Kedushas Levi, teaches us how we should serve Hashem: just like there are various levels of Love of Hashem, higher and higher, and Awe of Hashem, one above the other, so it is with Niggunim. So - "with the Songs of your SERVANT" - the Divine Service can be learned through the structure of Music [octaves]. Finally, Rebbe Levi Yitzchak himself composed niggunim! Thousands of Jews thronged to Berditchev, "to see the light of Rebbe Levi Yitzchak's face, to hear his exultations and Tefillos...His Tefillos and Niggunim spread to the multitudes, and many hearts tremble to them, to this very day." 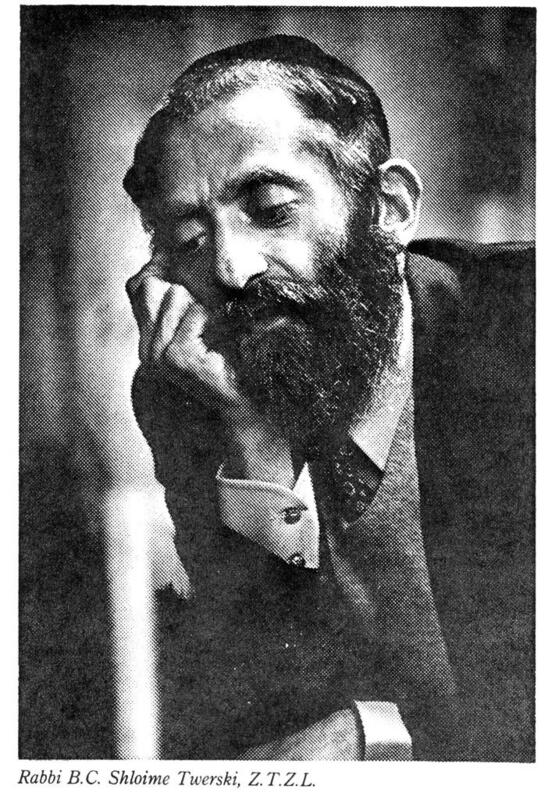 [Eliezer Steinman, Shaar HaChassidus, p. 140]. Indeed, we do have a few niggunim of his. Chabad Chassidim have a niggun-chant of his that was recited before Kaddish on Yamim Noraim. There is also a famous "Dudeleh," a niggun describing how Hashem is found everywhere ["Du" in Yiddish means "You."]. Chabad has an "Al Chet" niggun as well, which I'm not familiar with [guess I'll have to open the link, too.] And finally, there is the niggun of Rebbe Levi Yitzchak's made famous by Reb Shlomo Carlebach - "Lomir dir du tzeilin." "You should never ask yourself, 'What am I,' because you'll never know. Ask yourself, 'What am I doing?' "
"When I am what I am, I am limited. When I become what I become, I am limited. In between is the touch with Infinity. We must always be changing." 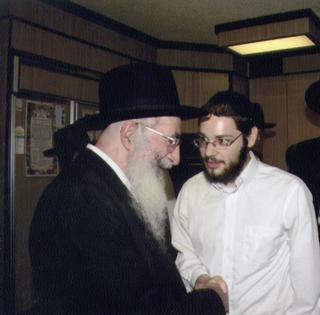 Rabbi Twerski, zt"l, was born in Cracow, Poland in 1923, and came to Milwaukee, where he grew up under the tutelage of his saintly father, ZT"L the revered Rebbe of Hornisteipel. Endowed with a brilliant mind, Reb Shloime drank in the rich Chassidic tradition of his forebears, while remaining keenly alert to the new challenges of America and its melting-pot culture. With penetrating insight and compelling authority, he was able to apply his commanding knowledge of Torah, Chassidus, and Kaballah, to address the kaleidoscopic and transitional Jewish landscape of the late 40's, the 50's and 60's. Reb Shloime assumed the rabbinate of Denver, Colorado, which he served with unsurpassed devotion until his passing in 1981. Rabbi Twerski was a pioneer in the outreach movement, to which he opened his heart and home, where hundreds came to seek the definition of their spiritual identity. Ultimately, in 1973, the Rav founded the Torah Research Institute, where he was able to devote himself full time to his outreach efforts. Reb Shloime was a teacher of unique stature. With breathtaking originality, depth and compassion, he was able to address large audiences in a way which left each listener with an intensely personal message. His clarity of language was filled with a subtlety appreciated by scholars of Torah and understandable to those with no background at all. Rebbe Shloime Twerski was the oldest of the Milwaukee Twerski brothers, which include Reb Michel, Reb Avraham Shia, and Reb Aharon [all Shlita, may they have long and good years]. 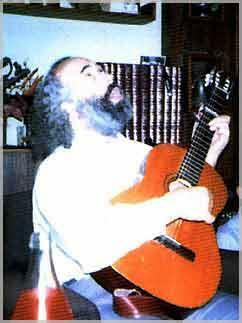 While he was not a prolific composer of niggunim, he often sang his younger brother Reb Michel Shlita's compositions. But he was blessed with a few very soulful tunes of his own - one of the most notable being his "Pischu Li." His son, Rebbe Mordechai Dov Ber, has succeeded him as the present Hornesteipel Rebbe. Rebbe Mottel has composed several niggunim of his own, some of which his beloved father Zt"L used to sing as well. [More about Reb Mottel Shlita, another time]. Zechuso yagein aleinu - May Rebbe Shloime's merit protect us! Tonight is the beginning of Hoshana Rabba, one of the Holiest days of the Jewish Year, perhaps second only to Yom Kippur. It was on Hoshana Rabba that there were special Hakafos [encircling] of the Mizbeach [altar] in the Holy Temple, with the willow branches [aravos] - seven times [see Mishnayos Sukka]. Hoshana Rabba is also the Ushpizin of David HaMelech, King David. The Ushpizin are our spiritual Sukka guests: our forefathers and teachers: Avraham, Yitzchak, Yaakov, Moshe, Aharon, Yosef and David. King David, who composed the Psalms - sefer Tehillim - was also known as "N'im Zemiros Yisrael - the Sweet Singer of Israel [the Jewish People]". So tonight has a very special connection to Negina. Moreover, Rebbe Shaul Yedidya Elazar Taub Zt"l, the second Modzitzer Rebbe, was born in the city of Osherov, in the Radom district of Poland, on Hoshana Rabba. When he was born everyone knew he would have a great talent for music, for not only was it Hoshana Rabba, but it was in the year Zemiros  or Zimras, which means Song[s]. [The secular date was Oct. 20, 1886]. Every year on Hoshana Rabba night, the Modzitzer Chassidim get together for a festive seuda [meal]. 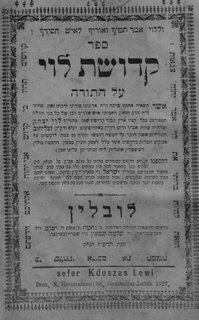 As is the custom of many throughout Sukkos, the fifteen Shir HaMaalos are recited - but in Modzitz, of course, they are sung. This is often preceded by an extensive sampling of the new niggunim that were composed for the recently-ended Yamim Noraim [High Holyday] period. This year, although the Modzitzer Rebbe Shlita is still in the hospital, and we wish him a speedy recovery - he was able to compose and record for his Chassidim 19 new niggunim. Some of these will be sung shortly at the Hoshana Rabba seuda in Bnei Brak, as they were on Selichos, Rosh Hashana and Yom Kippur this year! WHERE IS THE JOY & THE DANCE? In honor of Chag HaSukkos, I present the following idea, which I've adapted from a wonderful e-mail sendout by R. Sholom Brodt of Yerushalayim. Thank you, R. Sholom! In the Zohar (Vayikra 8a) we learn: Rabbi Yehuda began his teaching with the verse: "Serve Hashem with joy, come before Him with dance" [Tehillim, 100:2]. When we serve Hashem we are to serve Him with joy and love. In this way our service is complete. But how can we bring a sacrifice with joy? Surely we are to experience bitterness over our wrongdoings and cry before Hashem for having acted against His will. Where then is the joy, where is the dance? It is the Kohanim with their shining faces and the Levites with their song and music, who bring us back to the joy and thus our mitzva service is complete. Now that we cannot offer the sacrifices, we only have Teshuva. In doing Teshuva we must feel bitterness and remorse over our wrongdoings. But, our Teshuva also requires joy; otherwise it is not complete. Where then is the joy, where is the dance? We find the joy in the songs of praise that we sing to our Master and in the joy of Torah** study. With this joy, our Teshuva is complete. Sukkos and Shmini Atzeres come right after the Ten Days of Teshuva that begin with Rosh Hashana and conclude on Yom Kippur. Our rejoicing on the festival of Sukkos completes our Teshuva of the Days of Awe. We rejoice in the mitzva of 'the four species' and in our Sukkot. Music fills the air of Yerushalayim and Israel throughout the holiday, as we all get together to sing and dance each morning and evening, B"H. In this way we are completing our Teshuva and that is why Sukkos is "the season of our joy". *NOTE 1: Rav Moshe Wolfson is part of a very interesting "musical trio." In the biography of Reb Shlomo Carlebach, "Reb Shlomele", the following is found: Referring to Rebbe Shaul Yedidya Elazar of Modzitz [grandfather of the present Rebbe Shlita], it says, "[Reb] Shlomo and his friends, Ben-Zion Shenker and Moshe Wolfson, spent long hours with him [in one of the Catskill Mountain resorts] among the trees and lakes, absorbing the Modzitz melodies and philsophy" [pp. 24-25]. **NOTE 2: Indeed, it is the joy that comes with the learning of Torah that Chag HaSukkos is all about. As the Modzitzer Rebbe Shlita, who should have a refua shelaima b'Karov [a full and speedy recovery] pointed out on Hoshana Rabba of 1989, Teshuva via Torah helps to atone for sins that otherwise have no atonement. He cites the Tanna dvei Eliyahu [Ch. 18] which says, "Come and see how great the power of the Torah is, for it purifies the sinners of Israel when they do Teshuva." "And therefore, after Rosh Hashana and Yom Kippur, whose essence is Teshuva from Awe, comes the Chag of Sukkos, whose substance is Teshuva through Torah, to help atone for those sins that even Rosh Hashana and Yom Kippur cannot atone for." Is it any wonder that at the conclusion of Chag HaSukkos, we are graced with another gift from Hashem - Simchas Torah, the Rejoicing with the Torah? This post is dedicated to the Modzitzer Rebbe Shlita, Rebbe Yisrael Dan ben Rivka Zlata, may he have a full and speedy recovery! One of the most poignant parts of this Selichos - Yom Kippur season is a very short prayer which begins with the words, "Slach Nah." It's actually from two verses in Parshas Shelach, the portion of the Torah where we read about the spies who were sent into the Land of Israel, and came back with an evil report. The people, who accepted their report, were punished quite harshly: for every day the spies spent on their journey, a total of 40 days, the people were to spend a year wandering in the desert, a total of 40 years! Before hearing about this punishment, Moshe Rabbeinu pleads before G-d: "Please forgive the sin of this people, according to Your great love, and as You have borne [or forgiven] this people from [the time they left] Egypt until now." And then it says, "And G-d said, 'I will forgive, according to your word.' " [Bamidbar/Numbers, 14:19-20]. The Imrei Shaul of Modzitz questions why this verse should be mentioned in the Yom Kippur service. He explains with a brilliant thought of the Kuzmirer Rebbe. When G-d issues the punishment, the verse says, "yom l'shana, yom l'shana -- a day for a year, a day for a year" [14:34]. His great-grandfather, the Kuzmirer Rebbe, explains that this was a question and answer. The Accuser [Satan] asks, how could it be that the Jewish People could sin for an entire year, and then in a single day of Yom Kippur all their sins are forgiven? The answer is in this verse -- just as they suffered a punishment of a year for each day [that they spied], they can achieve atonement on one day for an entire year! So, indeed, this verse from the atonement of the sin of the spies, is very relevant to our Yom Kippur! Every year for more than a decade, the Modzitzer Rebbe Shlita has composed a new niggun for this section, "Slach Nah." Introduced on the first night of Selichos, it is one of the most moving pieces, year after year, of the dozen or so new niggunim that are created. It is my humble opinion that - perhaps - like his father, the Imrei Aish, is remembered for his "Chamol's" that he composed each year, the Rebbe Shilta will go down in Chassidic musical history for his Slach Nah's. [Time will tell if I am right]. Which, of course, brings us to "Chamol." The words are recited just after Kedusha in several of the Yamim Noraim prayers - both on Rosh Hashana and Yom Kippur. "Have compassion on Your creatures, and rejoice in them. And those that trust in You should say, in justifying those whom You carry [the Jewish people]: May the L-rd be sanctified upon all of His Creation, for You have sanctified your holy ones with Your sanctity; it is indeed fitting for the Holy One to be praised by his holy ones." Year after year, the Imrei Aish of Modzitz would compose a new niggun to these words. And year after year, the Modzitzer Chassidim would be uplifted -- for an entire year -- with the new "Chamol." It is almost impossible to put into words what this is. Suffice it to say that these are some of the most lofty, soulful and uplifting niggunim one can ever hear. Anyone who's heard them knows I'm not exaggerating. Only one that I know of has been released on an official recording - the one from 5715 or 1954. Besides Modzitzers, they have also inspired the likes of Reb Shlomo Carlebach -- whose "Ani Ma'amin" and "Lecha Ezbach" tunes both bear the influence of the Imrei Aish's Chamol's. Recently, Modzitz opened an Musical Heritage Institute, for the preservation and documentation of niggunim. One of their first projects was to release a series of recordings of the Imrei Aish's niggunim. To date, recordings of the "new" niggunim for the years 5723-5732 [1962-71] have been released. So, by obtaining these recordings from the Institute, you can get to hear another 10 Chamol's!!! Well worth it! Despite the excellent medical care at Ichilov Hospital, the lengthy time in a hospital bed has caused complications that require some complicated and serious procedures on the Rebbe Shlita. Now, more than ever before, we need to daven [pray] for his full and speedy refua shleima [recovery]. along with all other Jews who are in poor health, and may each one merit a speedy and complete recovery. On Rosh Hashana his condition was pretty stable, with no major changes. On Thursday and Friday we have seen some further progress, Baruch Hashem. On Thursday, one of the Rebbe's gabbaim helped the Rebbe Shlita put on tefillin, and his eyes were open for a good 5 minutes while they said Kriyas Shema out loud for him. At other times, he opened his eyes also for longer periods of time. On Friday, he opened his eyes for much longer, and one of his daughters said that he recognized things and people as well. When asked where things hurt, he was able to point with his fingers at specific spots. Someone in the hospital [Ichilov, Tel Aviv] said that he had come back from R. David Abuchatzera's [one of the Baba Sali's grandsons - who sees people in Nahariya] and that he had mentioned the Rebbe Shlita to R. David [that he needs a refua]. This is heartening to hear, but our tefillos [prayers] are still needed. for a refua shleima - a full recovery. "When I was a little boy, I always asked my father, 'Where are the songs of the Holy Temple?' And I never got a good answer, because I could not believe that Jews can live without at least one song from the Holy Temple; a song of King David, a song of beyond time and space, a song that reminds us that we are part of G-d.
"A few years ago, late at night, I saw a frail Jew by the Holy Wall [Kotel] who drew my attention. He really prayed. I waited until he finished and he began telling me he had arrived that day from Russia after ten years in Siberia. "That evening changed my life. Whenever I give a concert, I always include the prayers of the High Holidays. The melodies reach, like the Shofar, to the deepest chambers of our souls." [Many thanks to Reb Sholom Brodt for this]. And indeed, at every concert, Reb Shlomo would sing his "Simcha L'Artzecha" or "M'loch" or "Veyesahu Kol", and always precede it with the nusach of the Yamim Noraim - the High Holydays.